"Let's focus on what matters to people here: jobs, the economy, the Great Lakes, the things that we care about - why we want to live in this neck of the woods." Upton's party may have lost control of the House Tuesday. But Upton says he's optimistic about the future of cooperation between the parties in Washington. "We want to change the rules so that the House can function, so that we can take bipartisan ideas and move them forward, versus being shunned from either the Right or the Left. I think we can make a difference and I'm excited to be part of that process." Although he lost, Democrat Matt Longjohn says he's proud of his campaign. "I'm thrilled with the team, this amazing support we've received in the community, and honored to have run this race on behalf of some many people who need health and quality of life issues protected." Longjohn, who's a medical doctor, emphasized health care issues in his campaign. He thinks that's why the race drew so much attention. "Fred Upton touched a nerve. When he wrote the 'Upton Amendment' and put everyone's pre-existing conditions and essential health benefits on the line, we knew this was going to be a national race." Upton has been in Congress since 1986. Tuesday's election was one of the closest races he's faced. The line-up in the 20th State Senate District Tuesday was a re-run of the race in 2014. But yesterday's show had a different ending as Democratic challenger Sean McCann of Kalamazoo decisively defeated Republican Senator Margaret O'Brien of Portage. For years ago, McCann lost to O'Brien by only 60 votes. This time he beat her by about 11,000. McCann reflected on that last night. "I'm kind of numb and apparently there's been a big shift in things. I'm excited to be a part of that. And I just really appreciate the voters of Kalamazoo County so much for sorting through all the stuff that was thrown their way and seeing their way to have confidence in me and put me in the seat. And I will work my hardest to make folks know that they made the right choice." McCann says he's also happy about the outcome of Proposal 2. Voters approved the plan to create an independent commission to handle the drawing of political district lines, a job now done on a partisan basis by state lawmakers. "I'm super-excited about the passage of Proposal 2 to reform gerrymandering. I've been a huge proponent of that. And I'm sure that that helped people understand that I want good government. I introduced bills in 2013 that would have created the commission we have now approved by the voters. Now we have to work on campaign finance reform. I'm super happy; I could have lost and had that pass and been very happy." O'Brien says she's sorry not to get another term in the State Senate. But she's happy about how her campaign was fought. "You know, we had a really positive message, and it's really about thinking about the things we all share together. We all want our community to be great, our state, our nation. And I refuse to participate in this divisive rhetoric that's coming from the national (level) all the way down. And so we are very proud of the campaign we ran. We stayed positive; we only talked about what we had to offer. And at no time did we ever go to insult or demean another person. So, our heads are held high. We know we did a good job. It's always tough to lose but we know we kept our integrity and we kept the message about we had to offer." The third candidate in the race - Libertarian Lorence Wenke - got about 39-hundred votes. State Representative John Bizon of Battle Creek is heading to the State Senate. He defeated Democrat Jason Noble and Libertarian Gillotte in the 19th State Senate District Tuesday. Former Republican state representative Aric Nesbitt was the winner in the 26th Senate District in Van Buren and Allegan counties. It's still unclear who won the 61st State House seat that includes Portage. Unofficial returns Tuesday put Republican Representative Brandt Iden about 400 votes ahead of Democratic challenger Alberta Griffin. But that doesn't include absentee ballots. Iden wasn't ready to claim victory but he was optimistic last night. "You know, we're looking great. We're in a good position. Some of these absentee ballots are starting to break our way. We're currently in the lead and I think we're going to finish out strong. I still think it's too close to call at the moment. But I believe we're in a very good spot to be victorious at the end of the night." 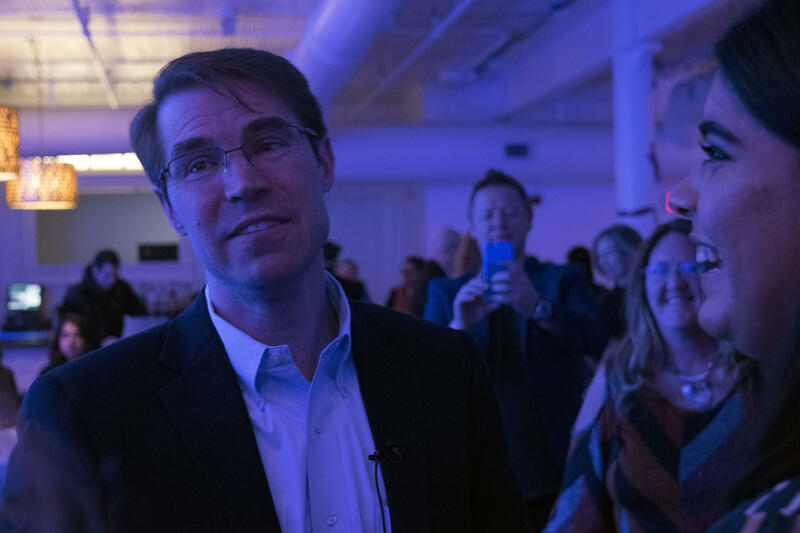 Democrat Jon Hoadley easily won another term in the 60th State House District that includes the City of Kalamazoo on Tuesday. In the 63rd District, Republican Matt Hall beat three other candidates. And in the 62nd District that includes Battle Creek, Democrat Jim Haadsma appears to have narrowly defeated Republican Dave Morgan. Republican incumbent Beth Griffin won a new term in the 66th District. So did Mary Whiteford in the 80th. Democrats will have a healthy majority on the Kalamazoo County Board, if unofficial results hold up. They appear to have won in eight of the 11 commission districts. That includes the 9th district where Democrat Christine Morse leads incumbent Republican Dale Shugars before absentee ballots are counted. In the 11th district, Democrat Meredith Place was leading incumbent Republican Scott McGraw. In the 10th district, in a race decided by a handful of votes in 2016, Democrat Mike Quinn led Republican opponent Steve Carra by more than 1,000 votes. The vacant seat in District 2 will be filled by Democrat Paul Haag, who ran unopposed. There will be two new faces on the Kalamazoo School Board. Unofficial returns from Tuesday's election show Jermaine Jackson and Tandy Moore getting the most votes in a five-candidate field. Among the losers was current Kalamazoo School Board Trustee Craig Herschleb. In Portage, three incumbents won new school board terms yesterday. WMUK's Zoe Jackson, William Edgerton, Greyson Steele, and Sehvilla Mann contributed to the reporting of these stories.